The A330-200 is the newest member of Airbus' widebody twinjet family and is a long range, shortened development of the standard A330, developed in part as a replacement for the A300-600R and a competitor to the 767-300ER. Airbus launched development of the A330-200 in November 1995, followed by the first customer order, for 13 from ILFC, placed in February 1996. First flight was on August 13 1997, with certification and first customer deliveries,to ILFC/Canada 3000, in April 1998. The A330-200 is based on the A330-300 and shares near identical systems, airframe, flightdeck and wings, the only major difference being the fuselage length. Compared with the 300 the A330-200 is 10 frames shorter, and so has an overall length of 59.00m (193ft 7in), compared with 63.70m (209ft 0in) for the standard length aircraft. This allows the A330-200 to seat 256 passengers in a three class configuration, or alternatively 293 in two classes. Because of its decreased length the A330-200 features enlarged horizontal and vertical tail surfaces (to compensate for the loss of moment arm with the shorter fuselage). Another important change is the addition of a centre fuel tank, which increases the A330-200's fuel capacity over the 300's, and results in the 200's 11,850km (6400nm) range. Like the A330, engine options are the GE CF6-80, Pratt & Whitney 4000 series and the RollsRoyce Trent 700. The A330-200 has sold quite strongly since its launch. Among the initial A330-200 customers are, apart from ILFC, Canada 3000, Korean Air, Austrian, Air Transat, Emirates, Swissair, Sabena, Monarch, Asiana, TAM, and Air Lanka. The download comes in a single .zip file. Within the .zip, you will find 2 different addons: the a330 and a plugin called Ground Handling Solutions (GHS) also by JARDesign. The version that comes with the a330 is locked specifically to the a330. There is a standalone version that works with every single aircraft, provided configuration files are present. I have purchased the full unlocked version of GHS, so that is the version you’ll see in this review. However, the locked version works exactly the same way. To install the a330, drag the aircraft folder into your (X-Plane Root)/Aircraft/Heavy Metal folder. To install the GHS plugin, drag the GHS folder to your (X-Plane Root)/Resources/Plugins folder. After installation of both addons, you’re good to go! The modelling is superb in the a330. Every little bit of detail, including door handles, and the gear controls have been modelled with precision. This varient comes with the Rolls-Royce engines. The textures of the engines look extremely sharp and they do an amazing animation while spooling up during engine start. These Rolls-Royce engines provide roughly 70,000 pounds of thrust. Here's a couple of screenshots of LAX ground crew busy preparing this widebody airliner for a short haul service to San Francisco. Ground Operations is a separate plugin that ships with the a330 and this particular version is locked so it works with only the a330. Disclaimer: I am using the full unlocked version, but both versions with the a330 is IDENTICAL - I've already tested it before reinstalling the full version. The Ground Operations plugin is described in detail a bit further into this review. For this flight, we will be taking Cathay Pacific flight CX610 on a very short hop from Los Angeles to San Francisco. There’s the aircraft just pulling in. Hopefully the inbound crew leaves the systems running for us so we can have a fast turnaround and onto the next leg to SFO. The last of the inbound crew has left the aircraft; let’s get on board, shall we? Here we are at the air bridge, just about to get on board. Ok first things first, let’s do a safety inspection check in the cabin. Here, you can see JARDesign has beautifully modelled the 2 class cabin, with Premium and Economy class. Safety inspection, check! Let’s head into the cockpit. Luckily, the inbound crew left the aircraft in a turnaround state, so we we can dive right into setting up the on board computers. First up, verify that we are indeed running cycle 1601 – the latest for January 2016. Here’s the INIT page after setup. Our route takes us from KLAX to KSFO, cruising at 32000 ft, and our flight number is CX610. If you own the JAR a320, you'll find that the MCDU works as the a320's; I haven't seen any new buttons/pages. There are of course a lot of new features I haven't seen from the a320 - one example is when you insert a SID and the computer now asks you to insert it as a temporary flight plan and then confirm it - much like Boeing's "execute" button. I would assume that this feature is now in the a320 as well, though I can't confirm because I haven't installed it since I moved over to my new custom PC build. Here’s the departure we’re flying out of LAX: the FIXIT2 departure. And the F-PLAN page all filled out and ready to go. Here's one item that I found to be a bug, or in fact realistic and I've been mis-led by other inaccurate Airbus addons in the past: the FCU only allows you to select either airports, VOR, or constraints – unlike the Boeings, you can’t have all on at once. Again, I'm not sure if this is a bug, or is accurate, but I've just been mis-led by other addons. However, it doesn’t affect my flight at all because I only stick airports on anyways. Here’s the entire flight plan & waypoints in a zoomed out view on the ND. Looking good! And the cockpit looks good as well; all preflight checks and duties complete, just have to wait for boarding to complete and we can pushback & start our engines. Now’s a good chance for me to show you the Ground Handling from JARDesign. Here, you have the menu – from the plugins dropdown. Drive Up All will drive every single truck / bus / van to the aircraft in sequence as per the configuration; this includes catering, luggage loaders, passenger bus, crew van… etc. The Drive Away All will drive the vehicles away in sequence after configuration. If you’re in a hurry to make it out of the gate, select Hide All and everything will disappear instantly. If you wish to only have select vehicles drive up to and service the aircraft, you can select the Control Panel option. This option allows you to control the vehicles you want to drive up to the aircraft and which to drive away. Similarly, you can also select one to hide and it disappears instantly. Note that the service vehicles will automatically open & close your aircraft doors. You do not have to touch the door menu – very realistic, as it’s the cabin crew + ground crew doing all the opening/closing of the doors. Pilots just monitor through the ECAM page. The new Beta version contains an additional feature: liveries. Now you can select (and I think even make your own) liveries for the ground service vehicles. For example, here at my home airport of CYVR, we have the Gate Gourmet liveries for catering trucks. In LAX you'd get a bunch like Sky Chefs. You can choose all of those liveries in the new menu in the Beta. The last of the passengers have now boarded and we are ready for pushback. The aircraft comes with a pushback service. And as always, it’s steerable pushback, so you control the direction – push/pull and left/right. Here's the pushback mid-range truck powerfully lifting up the nosewheel of the aircraft so pushback can begin. The horizontal arrows represent the direction the tail will be pushed to, and the the vertical arrows represent the direction. In this case, we are pushing backwards, so the arrow is pointing back. Our nose is going to the right in the 2nd screenshot and going left in the 3rd one. To stop the pushback, just deselect the arrows and when the shield has no arrows indicated, select disconnect in the plugins menu and the truck will lower the nosewheel and disconnect from the aircraft. The a330 handles very well on the ground. Like all aircraft in X-Plane, the heavier I load it, the heavier it feels. Vice versa for lighter loads. In this case, we're carrying almost full passengers for this busy ferry flight at the end of the holidays for some people, so the flight is packed. "Takeoff, manual flex, SRS" "V1, Rotate, V2"
Here’s a few quick shots of our aircraft blasting out of a cloudy Los Angeles. I hand flew this aircraft up to 25000 ft before I had to test the autopilot for this review. It is amazing to hand fly; the aircraft properly auto-trims itself and the FBW is just spot on. When I pitch the aircraft, it will stay at that pitch until I lower/raise the nose. Similarly, when I roll the aircraft, it will stay at that rolled degree until I stop the turn. If you get a moment to hand fly this aircraft, I strongly recommend doing so; you will be blown back by how well the aircraft listens to your inputs, big and small. Autothrottle also works perfectly; Takeoff was in the FLEX position, then to the CLB (climb thrust) dent and it stays there all the way until landing, when the throttles are pulled back. The CLB dent is pretty much the autothrottle. At the top of descend, the MCP altitude is pushed and the aircraft descends according to the vertical navigation path. There are, at times, when the aircraft does a sudden nose-dive, and at times when the aircraft suddenly levels off without anything in the way (eg. Flaps being deployed, not enough drag… etc.). However, a switch into manual descend will solve this. Here’s a few shots of the aircraft descending into KSFO. As I mentioned earlier, it is an absolute joy to hand fly this aircraft. I disconnected shortly after glide slope was captured and flew the approach onto runway 28R. The aircraft behaves perfectly to small sidestick movement. As my left hand does small corrections to pitch and bank with my sidestick (yes I actually fly Airbus with my left hand on the joystick), the fly-by-wire system reacts with precision as I make these corrections. I leave you with a couple of screenshots of the aircraft landing, taxiing to the gate, and shutdown. And here's CX610 on the taxiway at San Francisco. JARDesign has really perfected this a330. The cockpit textures and modeling are amazing and the systems needed to fly a normal operating procedure leg are all fully modeled. You cannot have dual ND operation. A previous addon I reviewed was able to have the sweeping terrain display on one ND and the weather radar on the other. This provides me with better situational awareness, as I can monitor the weather on the First Officer's side while seeing where each mountain peak is on my ND as I descend into mountaneous airports such as KLAX. The JARDesign a330-200 is a fantastic aircraft in so many different aspects - modelling, graphics, systems, attention to detail... etc. 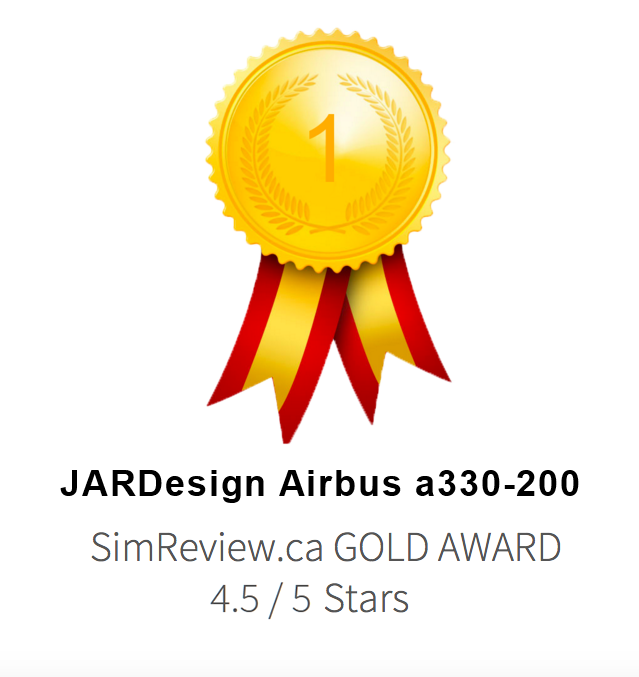 Though there were a few hiccups that I personally found could be improved, I'd like to present JARDesign with a SimReview.ca GOLD Award: and a rating of 4.5/5.